[105 Pages Report] MarketsandMarkets defines “customer self-service software” as a combination of customer and service interaction solutions, which are intended to empower customers to provision themselves. These solutions consist of Interactive Voice Response (IVR) systems, mobile self-service, virtual assistants, and e-support (web-based). These solutions empower end users to perform tasks or access data on their own, without the help of any customer service agent. End users can avail the service 24/7/365. Customer self-service is a sub segment of Customer Relationship Management (CRM) and is also used for Employee Relationship Management (ERM). Enhancing the customer service through self-service tools empowers companies to increase customer satisfaction and loyalty, thus gaining a competitive advantage and decreasing the churn out rate. Also innovative approach of sales and marketing has helped the companies to increase their customer touch points like promotional events, websites, questionnaires, and mail delivery which also is a driving factor for the overall growth of CSS software market as the companies can effectively use these touch points to deploy the CSS tools and technologies for enhancing the overall customer experience. Integration of artificial intelligence (AI), business intelligence (BI), and big data with customer self-service technologies to understand consumer behavior offers huge opportunities for customer self-service market. There are various ways in which AI with self-service can change the customer service experience, such as the conversational IVR, self-service/assisted service convergence, and changing responsive virtual assistants into proactive virtual advisors. Combining Natural Language Understanding (NLU) and conversation systems with customer center knowledge & learning forums will help develop an enterprise AI, which is as effective as human agents in a contact center. Integrating customer self-service technology with AI and BI will help automate customer self-service systems and add value to services, thereby improving the overall customer experience. Like AI, big data is also one of the big opportunities for transforming businesses to make better individual decisions. Today, data holds more value for business enterprises. Businesses derive data from different sources, including internal systems, external sales force, traditional & next-generation consumer touch points, and frontline employees. These data help organizations monitor and analyze the source that is more effective to offer better customer experience across all the communication channels. Huge amounts of data help gather accurate and reliable insights about the consumer behavior, thereby leading to achievement of business goals of companies. The growing adoption of smartphones and increasing use of social media helped fill the big gap present between customers and companies. The intention of introducing self-service was to make the service more convenient, faster, and to provide high levels of customer satisfaction. Enhancing the customer service through self-service tools empowers companies to increase customer satisfaction and loyalty, thus gaining a competitive advantage and decreasing the churn out rate. The report on Vendor Comparison in Customer Self-Service Software based on MnM DIVE Methodology analyzes and evaluates the key vendors in the customer self-service software market. We have selected 20 vendors for evaluations based on their breadth of product offering and robust business strategy. The focus of our vendor evaluation was on the product they offer in the customer self-service software market. A comprehensive list of all the vendors in this market was created through a product mapping strategy and MarketsandMarkets analysis. Based on their capabilities, innovations, and breadth of product offering, vendors were shortlisted. Our selected vendor mix includes the top 20 customer self-service software vendors selected based on the above given parameters. The report covers the comprehensive study of the key vendors offering solutions for customer self-service software. We have evaluated the following 20 vendors: Microsoft Corporation, Nuance Communications, Inc., Oracle Corporation, Sap SE, Salesforce.com, Inc., Aspect software Inc., Avaya Inc., BMC software Inc., Verint Systems, Inc., Zendesk, Inc., eGain Corporation, Freshdesk, Inc., Inbenta Technologies Inc., Creative Virtual Ltd., RightAnswers, Inc., 7, Inc., Pegasystems, Inc., Jive Software, Inc., Astute Solutions, and Aptean. 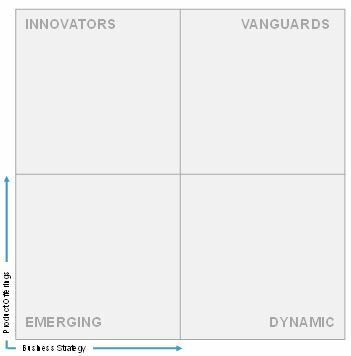 Vanguards receive high scores for most of the evaluation criteria. They have strong and established product portfolios and a very strong market presence. They provide mature and reputable solutions. They also have strong business strategies. Innovators are the vendors who have demonstrated significant product innovations, as compared with their competitors. They have very focused product portfolios. However, they do not have very strong growth strategies for their overall business. They have the potential to build strong strategies for their business growth, to be at par with the visionary leaders. Dynamic are the established vendors with very strong business strategies. They have the potential to broaden their product portfolio to compete with the other key market players. Emerging companies are the vendors with niche product offerings. They are starting to mark their presence in the market. They do not have very strong business strategies as compared with other established vendors. They might be new entrants in the market and require some more time before gaining significant market traction. Self-service is a convenient way to meet the growing customer expectations. Customer self-service is a combination of customer and service interaction solutions, which are intended to empower customers to provision themselves. The solutions enable end-users to perform tasks or access data on their own, without the help of any customer service agent. End-users can avail the service 24/7/365. CSS is a part of Customer Relationship Management (CRM) and is also used for Employee Relationship Management (ERM). The major growth drivers of the customer self-service market include need to improve customer satisfaction and loyalty levels, increasing availability of various customer service touch points, and increasing need of companies to gain competitive advantage and decrease customer churn out rate. Every organization, be it small or large, pursues to differentiate and achieve a cutthroat advantage over its competitors. In today’s aggressive world, availability, price, and quality of products are not sufficient for achieving a competitive advantage. The future stage of competitive differentiation is the ability to understand the customer’s needs and expectations at a micro-level. Large enterprises can gain an emulous advantage by cutting costs or introducing many innovative products & services, but there is less scope for SMEs for the same. SMEs can compete with large enterprises or can gain a competitive advantage in customer experience and in the service filed. Along with the competitive advantage, retaining the customer is also a crucial aspect of the business. To reduce churn out rate, companies need to understand customer needs, requirement, and ways in which companies can support & fulfill the customer’s requirement. Meeting the customer’s expectations, providing new value added services, gaining a competitive advantage, and listening to customers can help companies reduce their churn our rate. Thus there is increasing need to deploy customer self-service software to gain competitive advantage and decrease customer churn out rate. The increasing deployment of customer self-service tools may decrease the personal engagement and interaction of companies with customers this may act as a restraining factor for this market. Based on extensive secondary and primary research, key information about the vendor’s product offering and business strategies was gathered. After the completion of data gathering and verification process, the scores and weightage for shortlisted vendors against each parameter was finalized. After evaluating all the vendors, a comparison scorecard was prepared and each vendor was placed in the MnM DIVE matrix based on their product offering and business strategy scores. This report is instrumental in helping the stakeholders, such as customer self-service software vendors, system integrators, consultants, value-added resellers, and technology partners, to make business decisions on customer self-service solution deployments. The report covers the comprehensive study of key customer self-service software vendors, including Microsoft Corporation, Nuance Communications, Inc., Oracle Corporation, Sap SE, Salesforce.com, Inc., Aspect software Inc., Avaya Inc., BMC software Inc., Verint Systems, Inc., Zendesk, Inc., eGain Corporation, Freshdesk, Inc., Inbenta Technologies Inc., Creative Virtual Ltd., RightAnswers, Inc., 7, Inc., Pegasystems, Inc., Jive Software, Inc., Astute Solutions, and Aptean.